Snazzy case for a sweet price. Have you been thinking about building a quiet computer? 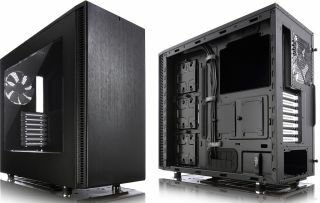 A good way to get started is by picking up a case designed to stifle noise, and that's what you get with Fractal Design's Define S. Even better, the mid-tower enclosure is currently on sale for $60. That price is after a $10 mail-in-rebate, so it's $70 before rebate, which is still lower than its regular $90 price point. With or without the rebate, it's a decent buy for a quiet chassis. The version that's on sale has a side window. Other parts of the build are equipped with dense sound dampening material to keep noise in check. If that's not a concern, the case also features "ModuVent" fan vent covers that you can open for additional cooling. For liquid cooling duties, the case supports up to four radiators, the biggest of which can be up to 420mm, and up to 360mm in the front. It comes with two fans, a 140mm one in the front and another in the back. Storage is fairly robust. The Define S has two dedicated 2.5-inch drive bays for SSDs and three 3.5-inch bays that can also hold 2.5-inch SSDs. The sale price for this case is valid today only. You can pick it up here.